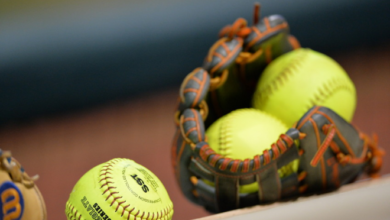 ESPN Hits it Out of the Park with Industry Leading NCAA Division I Softball Schedule - ESPN Press Room U.S.
ESPN will continue its commitment to NCAA Division I Softball with more than 650 games this season across its portfolio of networks. The industry-leading schedule features appearances by 23 of the preseason Top 25 with more than 20 television appearances by the top five teams—No. 1 Oklahoma, No. 2 Florida, No. 3 Oregon, No. 4 UCLA, and No. 5 Washington. More than 80 televised games will spotlight ranked teams, with more than 40 of those match-ups featuring a head-to-head ranked showdown. Games will be available on ESPN, ESPN2, ESPNU, SEC Network, Longhorn Network, SEC Network +, ACC Network Extra, and the ESPN App. ** Full schedule with network designation available below. ESPN and ESPN2 Schedule Highlighted by Reigning Back-to Back Champions and No. 1 ranked Oklahoma: Head Coach Patty Gasso and the Sooners will have four televised matchups throughout the regular season, traveling to No. 2 Baylor (March 31), and hosting Texas (April 28 and 29) and No. 21 Oklahoma State (May 5). Last season, Oklahoma swept the Florida Gators in the WCWS Finals, including an epic 17-inning game one. The two-game sweep (June 5-6 on ESPN) averaged a total live audience (TV + streaming) of 1,720,000 viewers, the most-watched sweep in Women’s College World Series Finals history. SEC Network: First pitch of a jam-packed schedule of more than 50 games is Tues, March 6, when Ole Miss hosts Boston College in Oxford, Miss. Later that same week, conference play will be in full swing for “All Softball Weekend,” eight SEC match-ups across two days (March 10-11). All eight games feature an appearance by a member of the Top 25, with six of the eight games see ranked opponents facing off. Among the many highlights on the network this season, Bases Loaded—a three-hour special presentation featuring all 12 SEC teams—returns on Friday, May 4, at 7 p.m. ET. Longhorn Network: The home of the Longhorns will carry every regular season home game and feature a slate of 40 games total including appearances by ranked teams No. 5 Washington, No. 7 Arizona and No. 16 Michigan. The Longhorns face the Huskies early in the season (February 21), the Wolverines as part of the Texas Invitational (February 23-25) and the Wildcats in a regular season series (March 2-4). The schedule kicks off with the Texas Classic (February 9-11).The full Texas Longhorn schedule is available here. SEC Network +: More than 250 games will be available this season. The SEC has nine schools in the preseason Top 25—the most of any conference—including No. 2 Florida, No. 8 LSU, No. 9 Texas A&M, No. 10 Alabama, No. 11 Tennessee, No. 13 Kentucky, No. 14 Auburn, No. 15 Ole Miss, and No. 25 Georgia. ACC Network Extra: More than 220 games, featuring all 12 schools, will be available to stream via the ESPN App. The schedule is highlighted by 20 appearances of No. 6 Florida State. ACC Network Extra’s schedule will continue to be updated throughout the season. ESPN App: All televised games, as well as SEC Network + and ACC Network Extra, will be available via the ESPN App. ESPN’s industry leading schedule features games from 19 conferences including—ACC, American, ASUN, American East, Big 12, Big South, Big Ten, Big West, Horizon League, Ivy, MEAC, Metro Atlantic, Missouri Valley, Pac-12, SEC, Southland, Sun Belt, SWAC and Western Athletic. Conference Championships: Wrapping up the regular season schedule again this year is a triple header of conference championships airing on ESPN and ESPN2 (May 12)—American, ACC and SEC. The first and second rounds of the SEC tournament will air on SEC Network and the semifinals will air on ESPNU. Early rounds of the ACC tournament will be available on ACC Network Extra. A full schedule of post-season play, including additional conferences, will be available at a later date. NCAA Division I Softball Championship: ESPN continues as the home of the postseason beginning with the selection show on Sunday, May 13 at 10 p.m. on ESPNU. Complete details for coverage of Regionals, Super Regionals and the Women’s College World Series will be available in the coming months.